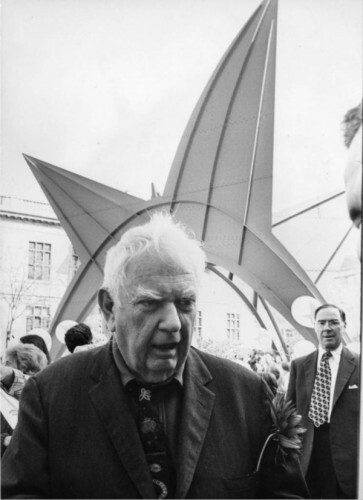 One of the most acclaimed and influential sculptors of the 20th century, Alexander Calder is most renowned for his invention of the mobile, an abstract sculpture that moves. 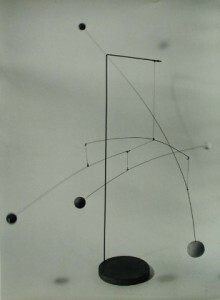 In addition to mobiles, Calder made wire sculpture, static sculpture called stabiles, toys, theatrical sets, and paintings in oil and gouache, as well as jewelry and numerous household objects. The artist, who owned a home and studio in Roxbury, Connecticut, for more than 40 years, created over 22,000 works in the course of his life and is considered a pioneer of kinetic art. Calder was born in 1898 in Lawnton, Pennsylvania, to a family of artists. His grandfather, Alexander Milne Calder, and his father, Alexander Stirling Calder, were both classically trained sculptors, and Calder’s mother, Nanette Lederer Calder, was a painter. 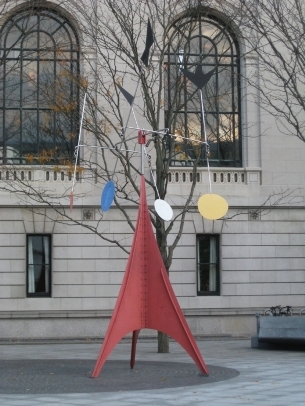 Instead of pursuing art directly after high school, Calder attended Stevens Institute of Technology in Hoboken, New Jersey, and graduated in 1919 with a degree in mechanical engineering. He held a variety of engineering jobs over the next few years but found none satisfying. In the fall of 1923 he began to attend drawing and painting classes at the Art Students League in New York. A year later, the National Police Gazette hired him as an illustrator. There, he drew sporting events and city scenes. On one assignment, Calder received a pass to the Barnum & Bailey Circus. His experience of the circus performances would inspire much of his later interpretation of movement. 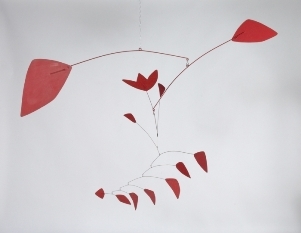 In the summer of 1926, Calder moved to Paris, the center of the Western art world and home to a vibrant community of artists interested in exploring new modes and methods of art. Soon after his arrival, Calder invented a new mode of sculpting in wire, a material he had used since childhood. In this radically new form of sculpture, expressive lines suggested volume and movement. Alongside the development of wire sculpture, Calder created the Cirque Calder, a small-scale circus designed to be manipulated by Calder in elaborate performances that could last several hours. Using wire, wood, fabric, and found materials, Calder constructed ingenious figures that he could propel into motion. Calder had a certain amount of control over the performance, but he purposely left some things to chance. He activated the acrobats, for instance, but there was no guarantee they would land on their feet. Calder’s lively performances of Cirque Calder engaged audiences on both sides of the Atlantic. On a transatlantic voyage in 1929, Calder met Louisa James, a grand-niece of Henry James, the great novelist, and his brother, William James, the psychologist and philosopher. Calder and Louisa married at her family home in Concord, Massachusetts, in January of 1931 and soon settled in Paris. In 1930, after a visit to Piet Mondrian’s studio in Paris, Calder shifted from figurative work to abstraction. His new abstract sculptures in wire retained the sense of action of his wire figures, but he also began to interpret motion as an abstraction by itself, as energy in space rather than the actions of a particular subject. Calder then added some articulation to these works, animating the wire constructions by means of cranks or motors, so that they could change position in space. In the fall of 1931, the French artist Marcel Duchamp visited Calder’s studio and was captivated by the utterly original motorized objects. Duchamp suggested that Calder call his new objects “mobiles,” a pun in French that means both “that which moves” and “motive.” Duchamp arranged for Calder to have his first exhibition of mobiles at the Galerie Vignon, Paris, in February of 1932. After seeing the mobiles, Calder’s friend and fellow abstract artist Jean Arp wryly commented that he might call his static wire abstractions “stabiles.” Calder immediately adopted the word. In a further leap, Calder began to create mobiles meant to be suspended from the ceiling, beginning with the striking and unique Small Sphere and Heavy Sphere of 1932-33. The artist began to move away from the motorized motions of his earliest works in favor of creations that responded to environmental conditions, such as currents of air, changes in humidity, or human intervention. In 1933, concerned about the rise of Fascism in Europe, the Calders decided to leave Paris for the United States. After searching the countryside around New York, they bought a 17th-century farmhouse in Roxbury. Inspired by the open space of his Roxbury property, Calder began to create works especially for the outdoors. The family also had homes in New York and France, but Calder retained a lifelong connection with Roxbury and produced numerous works in the studio on the property. For some of the larger works that required specialized fabrication, he worked with shops and artisans from the extensive metalworking sector of central Connecticut. Calder’s works are found in many museums and private collections in Connecticut, and Hartford‘s Wadsworth Atheneum Museum of Art began collecting his work in the 1930s. In 1937, Calder completed Devil Fish, the first large-scale stabile enlarged from a small model, a method that Calder would employ to produce increasingly ambitious monumental sculptures out of steel plates designed to be bolted together. Later that year, the Calders returned to Europe for several months. While staying in Paris, Calder created Mercury Fountain for the Spanish Pavilion at the Paris World’s Fair, where it was displayed in front of Pablo Picasso’s famous protest painting depicting the bombing deaths of innocent Basque civilians, Guernica. An overtly political work, Mercury Fountain used flowing mercury from the mines of Almaden, a hotly contested territory in the Spanish Civil War. After the end of World War II, the Calders began to spend more of their time in Europe, particularly France. In 1953, they acquired a house in Saché, a tiny town on the Loire. By the 1960s, the Calders spent most of the year at their home in Saché, and with the assistance of a nearby ironworks Calder began to fabricate his large-scale works in France. Many of these monumental sculptures were public commissions designed for busy urban sites, such as Man (installed in Montreal), La Grande Vitesse (Grand Rapids, Michigan), and Stegosaurus (on the Alfred E. Burr Memorial Mall next to the Wadsworth Atheneum Museum of Art in Hartford, Connecticut). Their scale, their eye-catching shapes and colors, and the lyrical way they complement their surroundings make these ambitious sculptures some of Calder’s most recognizable and beloved works. By the time of his death in 1976, Calder was a well-known, successful artist whose work was included in major museum collections and arrayed in public parks and plazas all over the world. Teresa Erskine Roth wrote about art history and her publications included the essay “Synthetic Statues,” which appeared in Calder: Sculptor of Air (2009). Alexander Calder Performs His “Circus” - Whitney Museum. YouTube, 1955. Link. “Yale University Art Gallery,” 2017. Link. “Alexander Calder - Collection.” Yale University - Discover Yale digital Content, 2013. Link. Sweeney, James Johnson. Alexander Calder. New York, NY: Museum of Modern Art, 1951. Zafran, Eric, Alexander Calder, Elizabeth Mankin Kornhauser, Cynthia E. Roman, and Wadsworth Atheneum Museum of Art. Calder in Connecticut. Hartford; New York: Rizzoli International Publications, 2000. Rower, A. S. C. Calder Sculpture. Washington; New York, NY: National Gallery of Art, 1998. Calder, Alexander. Calder; an Autobiography with Pictures. New York, NY: Pantheon Books, 1966.